2015 is expected to see more people “getting back to nature” in their gardening and lifestyle choices. And I can’t imagine any more welcome news! As a gardener and a lover of nature in all its forms, I am delighted to see that so many others are getting on board with the idea of not only spending more time outdoors but also of taking charge of their own health by growing herbs, fruits, and vegetables to sustain themselves and their families. In this age of fast-food restaurants, seemingly non-stop technological advances, and culture of immediate gratification, it is a breath of fresh air to learn that an increasing number of young people, specifically millennials (ages 18-34), are deciding to dedicate themselves to growing and raising their own food. And this doesn’t mean just edible plants, either. They’re also raising chickens for both meat and eggs, buying a goat or two for the backyard (for milk, meat, and/or to act as natural “lawnmowers”), and raising bees for their honey and their use as pollinators. Even clothes lines are coming back into fashion. I must confess to having had a collapsible clothes line for several years now. On a nice sunny day, it’s a great way to save water and electricity, and personally, I like how everything smells after having dried in the fresh air and sunshine. The move to create agri-hoods includes the push to go against or even reverse ordinances in neighborhoods that keep residents from doing the very things they are now wanting to do. Higher prices at grocery stores, fluctuating gas prices (usually going up, and they’ll never again consistently be what any of us would probably call “good”), increasing energy rates, the realization of the negative effects of chemical pesticides so often used on commercially grown produce, the desire to get away from meats that have been pumped up with antibiotics – these are some of the reasons so many people are choosing to make sure they know exactly where their food is coming from. Plus, it’s very economical. Health is definitely a top priority among modern gardeners, so designing a garden or landscape display that’s edible and nutritious is just as important as having one that’s attractive. Consumers are demanding products that are environmentally friendly and safe for children and pets. One that seems to be high on their list right now is something that we’ve carried and been excited about for several years now: the BrazelBerries® line of compact, low-maintenance, high-yielding blueberry and raspberry shrubs. Rain barrels and composters are a must-have for those wanting to save on their water bill and make their own natural fertilizer. In fact, some gardeners are even using a “laundry-to-landscape” method of water conservation which entails recycling grey water onto their plants. So simple, yet so beneficial to the environment and your wallet! Thankfully, some local governments are starting to become more involved, even offering rebate programs that assist in offsetting the cost of replacing traditional lawns with water-wise landscapes. All of this naturally leads to another rising trend: the use of cacti, succulents, and other compact plants that offer bold colors and delightful textures, even in small spaces, all while proving versatile, low-maintenance, and tolerant of drought and poor soil. It’s a win-win! I love how so many of the new gardening trends are inter-related! The desire to be healthier doesn’t just include eating home-grown fruits and veggies, but it also means make our WORLD healthier as well. Reducing yard runoff by planting rain gardens; designing our gardens to mimic nature by layering plants: trees, understory shrubs, and groundcovers; planting trees to help clean the air; and attracting bees and butterflies to act as pollinators. This is, of course, directly related to the growing idea of creating bed head-style gardens which work within the natural landscape, for an “anything goes” effect. It uses native plants to increase balance and diversity, since they require less water and fertilizer because they’re well-adapted to the local climate. Don’t think that everything going on in the gardening world this year is all about becoming self-sufficient and eating healthy, home-grown fruits, veggies, and herbs. It’s almost equally about getting outdoors and enjoying nature for its infinite beauty and incorporating all that into our daily entertainment. People are designing “garden-tainment” areas that incorporate decorative plants, edibles, fountains, garden accents, outdoor furniture, and more. Put it all together, and you have the ideal space in which to relax, entertain a few close friends, or even throw large spring and summer parties for the whole neighborhood! Basically, the fun is moving outdoors! Through the use of pops of color, such as pinks and teals, gardeners are creating visually appealing displays, and this includes their furniture cushions, ornamental flowers, patio planters, bird feeders, you name it. Pink and teal are really popular right now, and inversely, so are rustic, natural colors that offer a vintage, homey feeling. 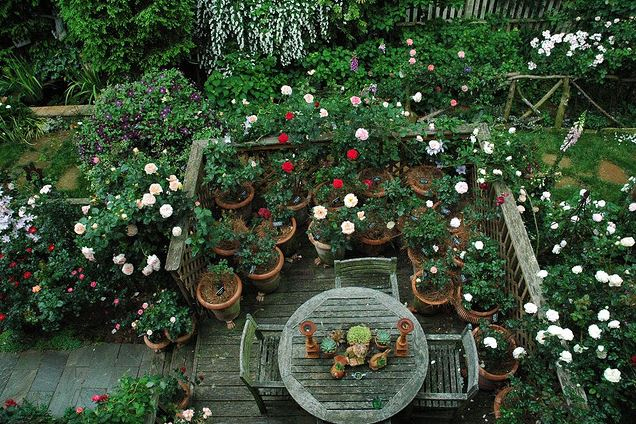 And they’re bringing their plants up close, whether because of having little space or because they simply want to surround themselves by all the lush, green foliage and bright, fragrant blooms they possibly can. Which is exactly why sales are increasing for flexible, lightweight planters with wheels or handles – in other words, portable gardens. There are so many exciting things going on in the gardening world right now, it’s almost impossible to address them all. And it is so gratifying to see a new generation of men and women becoming excited about growing things. After all, gardening doesn’t just bring joy (or nourishment) to a few people; it has a positive effect on the entire world. In 2015, let’s encourage everyone we can to take care of Mother Earth, and she’ll return the favor!